So, after 6 1/2 years of my 25km commute (often twice a day) I have bowed to the inevitable, followed my wife’s example and got a Pedelec. It’s restricted to 16mph so I still get some exercise but, by God, it’s a wonderful thing. It’s utterly hilarious to blat around the woods and tracks near me here in Frankfurt. Bosch middle motor, 400wA battery, 1x9 Shimano drivetrain, lock out fork, hydraulic brakes. i got it used for €900, which is just over half what they retail for now, and just under half what it cost new in 2016. Looks like fun! I'm pretty fortunate to have a short commute, but for one like yours, I'd consider going to the dark side as well. Yeah, I think 8 miles each way - with hills - is a reasonable justification for getting one. My best time on my drop bar commuter bike was 29mins, and that was taking loads of risks and I was a right sweaty mess at the end. I do it in 30 mins now consistently and - pretty much - easily. It justs flattens out the terrain so effectively. Also, there is zero temptation to jump a red light as the thing whips you back up to speed so well after a stop. They’re not for everyone, but this one works well for my circumstances. 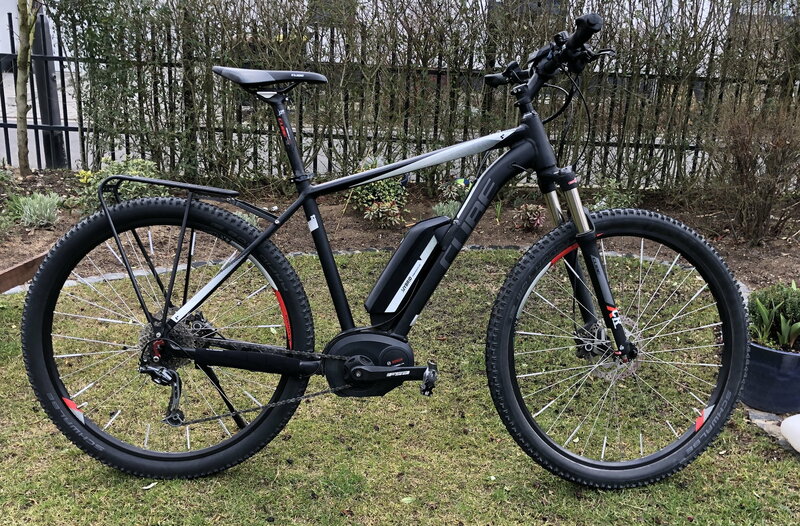 First of all, it looks perfect, as, if I bought an ebike, I would buy one just like that, though I would put slick tires on it. Second of all, you got an amazing price. Third of all, it's so much fun! Surly brought out a new version of the Big Dummy with a Bosch motor. It looks good but... the price tag is astonishing! I have a set of Big Apple-style tyres that I got a few years ago for very little money, that I’ll throw on I think. They are a hoot to ride. Super things.